The crucial role that mental skills play in high-level performance has been well demonstrated. Williams and Krane (1998) found out that certain mental skills are usually associated with successful performance (e.g. goal setting, self-regulation of arousal, heightened concentration, high levels of self-confidence, motivation and commitment). Gould and colleagues (Gould, Guinan, Greenleaf, Medbery, and Peterson, 2000) verify existing sport psychology research on successful Olympic teams’ performance and highlight that, when developing successful athletes, practitioners should a) teach athletes about the mental factors associated with performance, b) develop long-term mental skills programs, and c) teach strategies for dealing with unexpected distracters. Moreover, Vealey (1994) suggests that sport psychology needs intervention research done by practitioners to “clarify patterns of understanding that are developed in practice” (p. 501), if we want to be effective in working with athletes. The present study is an example of the practitioner-based research that Vealey (1994) advocates. The Nine Mental Skills of Successful Athletes – 9MSSA (Lesyk, 1998), is a holistic, practical model for systematical integration of the many diverse techniques used in performance enhancement. The nine skills are presented in three sequential levels. Level I – skills that constitute a broad base necessary for achieving long-range goals, learning and developing as an athlete, and sustaining daily practice (attitude, motivation, goals and commitment, people skills). Level II – skills that are used immediately before performance (self-talk, mental imagery) and Level III – skills that are used during actual performance (dealing with anxiety, dealing with emotions, and concentration). Each level incorporates and is based on skills learned at the preceding levels. The purpose of this paper is to present the Nine Mental Skills of Successful Athletes model and illustrate its use in the assessment and delivery of mental skills training programs with athletes of several representative sports. Precisely, the direct goal of the study was to assess and then improve each athlete’s mental skills, and to document the improvement. Subjects were elite and high-level athletes from Belgium and the United States, representing a wide variety of sports such as gymnastics, taekwondo, golf, basketball, weight lifting, figure skating, swimming, etc. (details of the athletes will also be provided). The Nine Mental Skills of Successful Athletes instrument (English and French versions) is used to assess an athlete’s current proficiency in each of the nine mental skills. It is a 30-item, self-assessment questionnaire in which the athlete, after reading each item, is asked to think about his own sport experience. He is then instructed to answer the question “to what extent does your behavior fit the description?” with a number between 0 and 10 (0 being “not at all similar” and 10 “very similar”). A simple scoring procedure yields a summary score for each of the nine skills. These scores are graphed and presented to the athlete in a form that is easily understood. Scores below 85 percent represent deficiencies that should be addressed in mental skills training. The Nine Mental Skills of Successful Athletes instrument was administered to each athlete in order to assess his current proficiency in each of the nine skills. This was followed by an interview in order to further clarify the subject’s responses so that an accurate, individualized, intervention plan could be designed. Individual mental skills training sessions were then conducted with the athlete, sometimes with the participation of the individual’s coach. At the conclusion of the mental skills training sessions, the instrument was administered again in order to assess the effectiveness of the intervention. We will present a wide variety of cases, with measurements before and after that illustrate the successful use of this model in the assessment, planning, and conducting of mental skills interventions. Our data include several athletes’ profiles (before and after intervention measures) and different examples of individualized, intervention plan in order to improve sport performances and achieve optimal sport functioning in general. 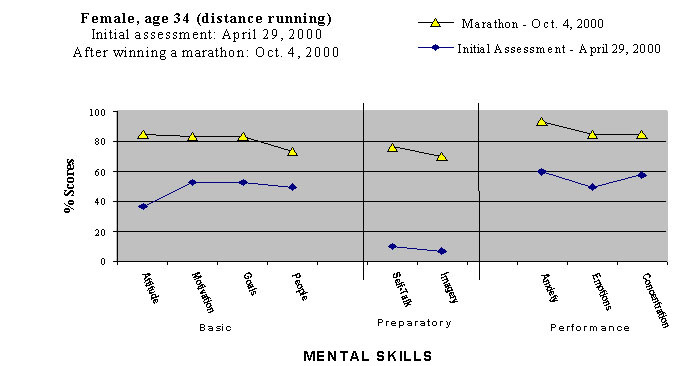 Examples of Nine Mental Skills of Successful Athletes graphs before and after scores will be also provided (see Figure as single example). The study reports a longitudinal, action-research intervention involving athletes from two countries and a wide variety of sports, using the Nine Mental Skills of Successful Athletes model. The results support existing sport psychology research on mental skills and peak performance. Specifically, our findings support 1) that mental skills are effectively learned and can be improved through instruction and practice, and 2) that 9MSSA tool is a relevant practical method to enhance mental skills and to evaluate effectively the work of the applied sport psychologist. Moreover, this practical model, as well as the definition of the skills, is easily understood and used by athletes and coaches. Finally, the model provides a useful framework for applying what has been learned through sports participation to other areas of life. Gould, D., Guinan, D., Greenleaf, C., Medbery, R., and Peterson, K. (1999). Factors affecting Olympic performance: perceptions of athletes and coaches from more and less successful teams. The Sport Psychologist, 13, 371-394. Lesyk, J. (1998). The nine mental skills of successful athletes: A holistic model for assessing and teaching mental skills to athletes. Workshop presented at the Annual Conference of the Association for the Advancement of Applied Sport Psychology (AAASP). Hyanis, MA, USA. Vealey, R.S. (1994). Current status and prominent issues in sport psychology interventions. Medicine and Science in Sports and Exercise, 26, 495-502. Williams, J.M., & Krane, V. (1998). Psychological characteristics of peak performance. In J.M. Williams (Ed. ), Applied sport psychology: Personal growth to peak performance, pp. 158-170. Mountain View, CA: Mayfield.